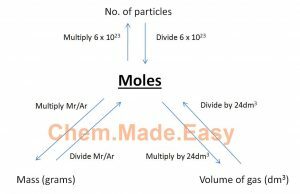 Well, whether you are doing combined chemistry or pure chemistry, the surprising fact is this – most mole calculation questions can be solved in 3 steps! These same steps can be used repeatedly, over and over again, no matter how they twist and turn the question! Before I get to the 3 Step Method, here’s a nifty flowchart you can use if you haven’t already memorised the formulas! 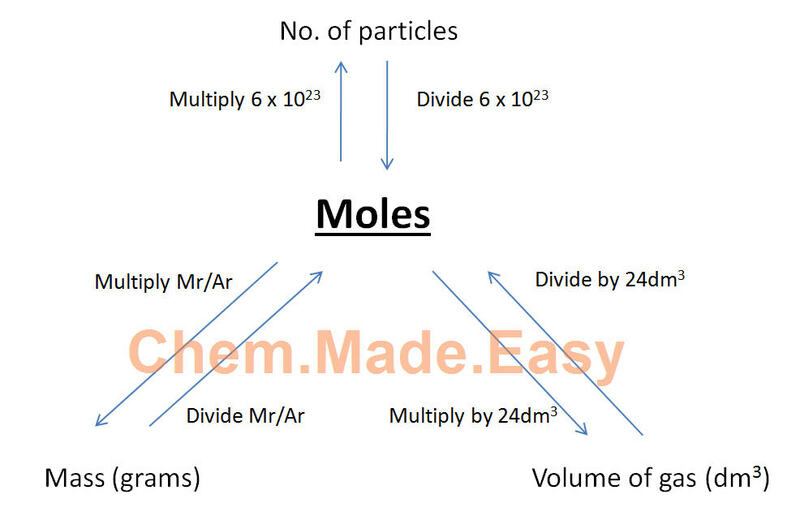 The first thing you want to do when you come across ANY mole calculation question is quickly look through the given information and calculate the number of moles of substances given! If you are given the mass of a reactant, divide by its Ar/Mr to find the number of moles. If given the volume of gas of a reactant, divide by 24dm^3 to find the number of moles. If given the volume and concentration of a reactant, multiply them together to obtain the number of moles! E.g. A student adds 48g of Mg to a solution of CuSO4. Find the mass of Cu obtained at the end of the reaction. The only information we have here is the mass of Mg. Hence, use the mass of Mg to find the number of moles of Mg first! Once you have the number of moles, we move on to the next step – which is to use the mole ratio to find the number of moles of whatever substance you are looking for! The mole ratio of Mg(known) to Cu(what you want to find) is 1 : 1. Since we calculated 2 moles of Mg in step 1, there will be 2 moles of Cu formed. The last step of the 3 step method is to find the unknown… in this case unknown mass. Since we already know the number of moles of Cu produced, we can use the mass formula in the flowchart to find the unknown mass! As some of you would have suspected, there are a group of teachers who will spend most of their free time, thinking of ways to make questions more… interesting! So how can we solve these more complex problems? Well, I’ve grouped these more complex problems into 3 main groups. This type of question is slightly more complex. You are given information on BOTH reactants. So the question is… which should you use in the mole ratio step? To determine which reactant to use, you will need to establish which reactant is in excess and which is limiting. a. Find the number of moles of both reactants. b. Choose 1 reactant, either one is fine, use the mole ratio and determine if the other reactant is excess or limiting. In the above reaction, 10g of methane, CH4, reacts with 5g of oxygen to form carbon dioxide and water. Find the volume of carbon dioxide gas produced. As we are given information on BOTH reactants, we need to first figure out which is excess and which is limiting! Choose 1 reactant (up to you!) – I will choose oxygen. From the mole ratio, methane : oxygen is 1 : 2. This means that 0.15625 moles of oxygen will require 0.078125 moles of methane. As we have 0.625moles of methane, we have MORE than required hence methane is in EXCESS. Once we know which reactant is limiting, we will use the number of moles of the limiting reactant and go back to the 3 Step Method to solve for unknown! Mole ratio of oxygen : carbon dioxide is 2 : 1. Hence 0.15625 moles of oxygen will produce 0.078125 moles of carbon dioxide. Volume of carbon dioxide gas is = 0.078125 x 24dm3 = 1.875dm3. The last type of question is when information is given about both reactants and products. If you encounter questions like that, ALWAYS use the information on the products to calculate the number of moles and carry out the 3 step method. The information on the reactants is probably redundant. If you have 1000 eggs and you only managed to bake a 1kg cake. How much sugar do you need? Congratulations! You made it to the end of a very very long blog post. One of the fastest ways to improve is to practice more questions. So, go grab your questions on moles, and test out the 3 step method! As always, if you have any questions, feel free to contact me via the contact page here, leave a comment in the box below! I promise I will try to reply ASAP!